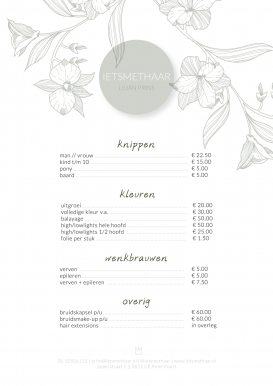 ietsmethaar was created by my need to beautify hair. As far as I can remember I’ve always loved working with hair and make-up. Not because I think it’s a necessity in every day life, but because of it’s creative aspect; it being a tool to create your own identity. I’ve done the make-up and hair for several shows, shoots, video-clips, advertisements, parties and weddings. For recent projects visit my portfolio. These collaborations have inspired me to connect people and for this specific reasons I have created a work-space in the center of Amers-foort, called NTWRKPLK. I utilize this workplace for hair- and make-up styl-ing, as a meeting space and an ideas breeding ground. This diversity ensures that I keep doing my job full of enthusiasm and passion. You are very wel-come to join us! I’m located in the inner city of Amersfoort. 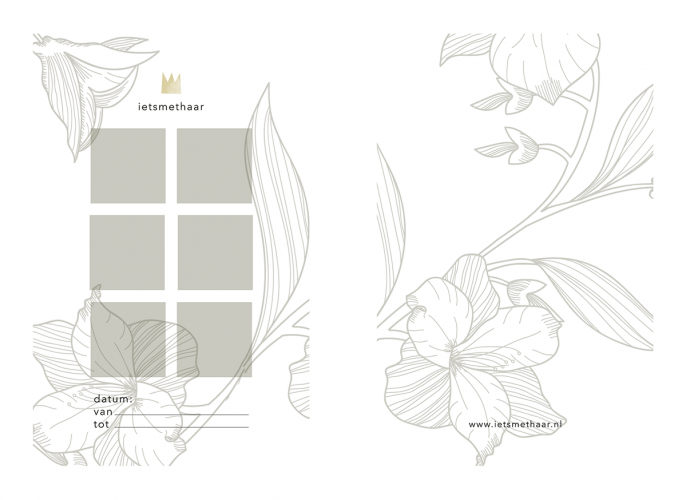 a special hair stylist loyalty stamp card and gift card you can buy. or get your eyebrows perfectly sculpted. It also lists the prices for bridal makeup and hair. Buy 5 treatments in advance and receive a sixth treatment for free. This concerns all hair treatments, whether it is hair styling, hair dyeing or eyebrow sculpting. Is there a birthday coming up? Or do you want to gift someone without reason? Gift a giftcard! You choose the amount, whether it’s for a man, woman or child, choose hair deys or some other nice extra. 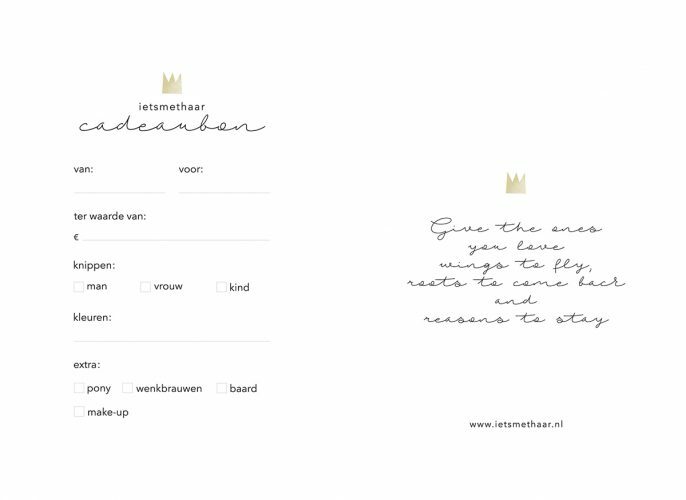 At ietsmethaar you can come in to get a haircut or dye your hair but also to trim your beard or get your eyebrows perfectly sculpted. It also lists the prices for bridal makeup and hair. I can create beautiful bridal makeup looks and wedding hairstyles for brides in and around Amersfoort. With every look I try to capture the personality of the bride. This way the bridal look is unique every time. Below you can see some of the wedding looks I’ve created. Give shape to your own identity. your perfect bridal make-up or bridal hairstyle and come visit me in Amersfoort.